“We are still trying to piece together whether the vehicle was lit then he got out the car or whether he got out the car and then the vehicle took flame,” Victoria Police Commissioner Graham Ashton told reporters: Video: Police were confronted by a knife-wielding man after responding to a car fire. (ABC News) posted to Twitter and broadcast on television showed the man swinging a knife at two police officers, while his truck burned in the background. video showed. Other footage showed two stab victims lying on the ground nearby: The attacker died in hospital, as did one of the victims, Ashton said. “From what we know of that individual, we are treating this as a terrorism incident,” he said of the attacker………………..One of the officers shot the man and he collapsed to the ground clutching his chest, the video showed. Other footage showed two stab victims lying on the ground nearby. 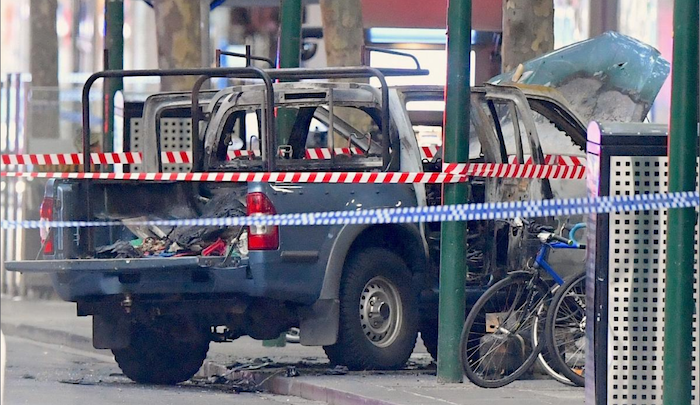 Victoria police declined to comment when contacted about Islamic State’s claim: The militant group also claimed responsibility for a deadly siege in the city in 2017 when a Somali man was killed by police after taking a woman hostage. All of the victims were men, Ashton said. He declined to release their names because police were still in the process of contacting families: Police later said the two wounded men were aged 26 and 58. 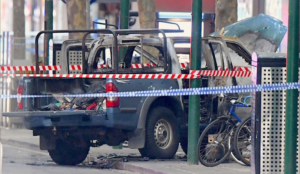 One man charged at the tall attacker, who was wearing a long black shirt, with a shopping trolley just before police drew their weapons………..A witness, Markel Villasin, told Australian Broadcasting Corporation radio: “Bystanders were yelling out ‘just shoot him, just shoot him’.” They did.